16-year-old Han Alister encounters three underage wizards setting fire to the sacred mountain of Hanalea. Alister is unaware that this will lead to a series of events that threaten to consume the world in chaos. To prevent the wizard Micah from using a magical amulet against him, he makes Micah give him the amulet. Later Alister learns that the amulet has an evil history, and it once belonged to the Demon King. 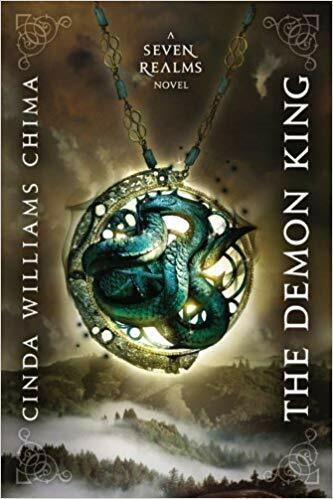 The Demon King is an evil sorcerer who almost destroyed the world a millennia ago. Now, the wizards will stop at nothing to get their amulet back. Princess Raisa ana’Marianna, heir to the Gray Wolf throne of the Fells, has her own battles to fight. After spending three years of freedom with her father’s family at Demonai Camp, riding, hunting, and working at the famous Clan markets, she learns that her life is going to completely change. Court life in Fellsmarch pinches like a pair of tight shoes, and Raisa feels like a cage is closing in around her. However, an arranged marriage and an eroded inheritance are the least of her struggles. The power of the Wizard Council is growing, and her people are starving and rebellious. Even though both Alister and Raisa come from different backgrounds, they wind up in a race to keep balance in the Queendom and to save Fellsmarch. The action takes place in this first novel mainly in the mountainous Queendom of the Fells. The Seven Realms, which are seven loosely related areas that were once ruled by the Gray Wolf Queens and their wizard consorts, or kings: Queendom of the Fells, the Kingdom of Tamron, the Kingdom of Arden, the southern Kingdoms of Bruinswallow and We’enhaven, the Southern Islands, and the Northern Islands. As readers of this blog have noticed, I seem to have a real appetite for fantasy this year. I really enjoyed this one, and as I have all four books on hand, went straight on to the next one. Pretty darn good for those who enjoy fantasy. A sequel series has been announced, titled The Shattered Realms. The first novel, titled Flamecaster, was released in April 2016. This entry was posted in Books & Reading, current reading, Fantasy. Bookmark the permalink. That’s funny, because I was going to mention a fantasy i read this week, but my fantasy is not so “fantasy” as your fantasy! Anyway, I read Charlie Jane Anders’s ALL THE BIRDS IN THE SKY, which won both the Nebula Award (for Best Novel) and Locus Award (for Best Fantasy Novel), among others in 2017. I read it after reading and liking her book of short stories, and I liked it a fair amount. Currently reading John Harvey’s BODY & SOUL. He wrote three books about ex-London cop Frank Elder a dozen or so years ago, and brought him back one more time for this final book. Elder ended up in Cornwall (you can read the earlier books to find the back story) but is trying to help his troubled daughter after she visits him and he sees she tried to cut her wrists. I always like Harvey’s writing, though I prefer the Charlie Resnick books, set in Nottingham. I didn’t think ALL THE BIRDS IN THE SKY was very “fantasy”, to tell the truth. But the audience of voters did, and the publisher labelled it as such. Mine had wizards and magic, although there were none of the other classic Tolkeinian elements of dwarves and elves. I liked Harvey’s Resnick books, though I don’t think I finished reading all of them. That’s what I was trying to say. Yes, there were fantasy elements (talking to and understanding cats and birds, mainly), but it wasn’t really my idea of fantasy either. Yes, you certainly have been reading a lot of fantasy novels in 2019! Now, you’re tempted me to do the same thing! I’ve been reading mostly Library books to whittle down that book stack. I watched some of the NCAA Men’s Basketball games. The Duke vs. Michigan St. game was a classic! Do you have a favorite in the Final Four? I’ve been reading fantasy, mystery, and historical. NCAA? Probably Purdue, I guess. I really have no horse in that race, but a final of Purdue vs. Michigan State would be interesting. Oops, I guess VA won that game? So TexTeck, Michigan State. I’ve been having a problem reading much of the newer fantasy and science fiction, Rick. As I get older, I find I am drawn more to older works. Must be the curmudgeon in me. I read very little this week, only a variety of short stories (only two stories left in Penzler’s massive Holmes anthology!) from various sources. I’m hoping to move onto SCARFACE AND THE UNTOUCHABLES this week. Glad to hear that you got some gardening in this weekend and I hope the good weather keeps up. Gonna rain all this week, Jerry. This fantasy series, and the one by Michael Sullivan, are darn good. I haven’t read much fantasy lately. In January I read GOOD OMENS by Pratchett and Gaiman.The series you are reading sounds like the fantasy novels my son likes. This weekend I finished reading UNDERSTANDING COMICS by Scott McCloud. I also read the two UMBRELLA ACADEMY graphic novels. I am currently reading TARNISHED ICONS by Stuart Kaminsky (his series set in Russia) and THE SHORTEST WAY TO HADES by Sarah Caudwell. I usually don’t read two fiction books at once. And I have started SHORT CUTS, short stories by Raymond Carver. I have, and read the McCloud many years ago, quite worthwhile. He wrote another, as well. I’ve enjoyed the Kaminsky books that I’ve read in that series, but it’s been a while. Almost done MAISIE DOBBS and ready to start A FRIEND IS A GIFT YOU GIVE YOURSELF (Bill Boyle). Love SHORT CUTS by Raymond Carver although I think perhaps the stories in that book was culled from others to fit the movie. Love every story he wrote. I’ll have to look for Carver stories. The Library of America did his Collected Stories. Maybe your library has it. I like him too.